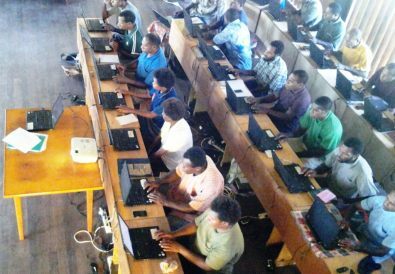 LTPNG’s latest Basic Computer training has been with the Evangelical Brotherhood Church (EBC) in Wewak. The request for this needed skills training to equip the pastors and ministry leaders for today’s church continues to be the main activity for the LTPNG personnel. 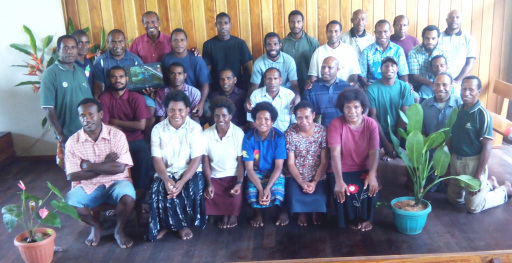 For the Evangelical Brotherhood Church (EBC) in Wewak this recent training is the first for the MOMASE region (Morobe, Madang and Sepik Provinces). The first 30 participants completed the course on Friday (4th September 2015) making way for more Basic Computer Training for the EBC pastors and ministry leaders in 2016 and beyond. The senior Pastor for EBC Wewak Pastor Joe Suai has already made plans to engage the LTPNG team for another two weeks in 2016. Pastor Joe stated that, “Besides men in ministry and leadership, there are many dedicated women pastors and ministry workers in our Church circuit and I will make sure that both men and women are equally represented in the next training. These next training will also involve teachers in the church’s education services program. One of the major obstacles in conducting training in the remote areas is the furniture and so when available, proper sitting arrangement can be organized easily thus creating an environment for learning to take place. The church buildings are the natural choice as you will always find something to sit on. 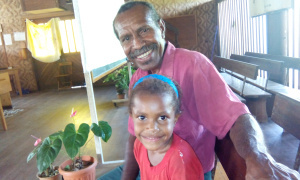 The church here in Wewak had the basics available for the team to prepared it for the course; moving the blackboard on wheels and covering it with white material, arranging the new desks and then completing it with flower pots. The first morning started off with setting up computers and then having the participants to have their places according to their registration arrangements; a registered participant would have a LTPNG computer to do the course. This was then followed by participants who had personnel computers to find their places; now we were ready to do devotions and start off the course with 30 participants. We have discovered that the registration process is ongoing and the due date is before the graduation day. Therefore the challenge is to work closely with the senior pastor to print the certificates making sure that all have registered for the training. Hebrews 12: 2a says that we are to fix our eyes on Jesus who is the source and the perfecter of our faith. 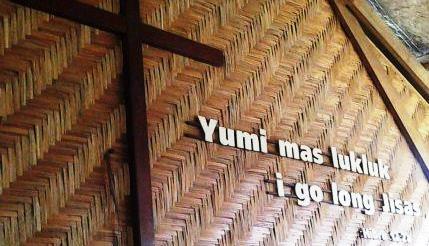 The EBC church in Wewak has this beautiful Scripture on the front of their church. It is a great Scripture verse for encouraging the pastors to take up the new challengers of today’s technological era by fixing their eyes on Jesus. Interestingly, spelling Wewak phonetically becomes “We work” so we bring it into the contents of conducting the BCT for the EBC pastors in Wewak becomes; “We work to gain knowledge of the basic computing skills by fixing our eyes on Jesus. We started the devotions by encouraging them from the words of Apostle Paul in Ephesians 4:11 that Jesus personally gave the different gifts for ministry in the Church with the bottom line of building up the body of Christ toward attaining the full stature of Christ (4:13). Elder Andrew Kanawi expressed his gratefulness for the course by stating that he did not imagine that he would in this kind of course; he can see his children participating but not an older person like himself. He concluded by saying that it is only because of God’s grace that he can participant in this course for the ministry he is involved in. A Community Health Worker (CHW) Mr. Rorope Wangu was all smiles after he received his certificate because as a health worker his knowledge of the basic computing skills will help him to monitor patient and drug figures. He said even though I do not fully understand all that was presented I have seen enough to know that the basic skills learned with really help me in my work. This particular trip involved freighting 24 laptop computers, accessories and a video projector, making two connection flights via Lae and Madang. The good thing was that it was the same Airlines PNG (APNG) aircraft that took us from Goroka to Wewak. The major concern was that we had to pay a lot for the excess baggage for computers. Pray for wisdom for the team to check out flights available by different commercial and mission organizations so that computers can be transported economically and safely for training. For Lina and I in Wewak, East Sepik Province, we survived the heat and enjoyed excellent hospitality by the EBC pastors and their families as we waited for the second part of the training with the South Sea Evangelical Church (SSEC) in Brugam. Something that really caught my attention on our assignment with EBC pastors in Wewak is the teacher student respect. The participants respected us so much that we did not have meals together; every meal was served separately for us. One evening I broke this respect tradition and invited a number of pastors for coffee; we had a great time listening to their ministry stories out in the outlaying jungles and rivers where even Wewak town does not hear about. We had the WiFi Bible Box on during the duration of the course and the participants were able to download resources with ease; Tok Pisin Bible App is the hot item that all who had smart phones now got it on their devices. Please pray that the Lord will allow and guide us to have the second BCT in 2016. Thank you again for faithfully praying and supporting which made it possible for CRMF to offer this most needed training.